We do something really special once a week at the guesthouse kitchen. We do no order it in, buy it on sale to stock up or worst of all, buy frozen with the ‘pretend-its-homemade-by-calling-it-homebaked line. We also do not just make puff pastry and roll it into a crescent shape. No. Just no. We make our own croissants. From scratch. With yeast, butter and flour. Some things are sacred. 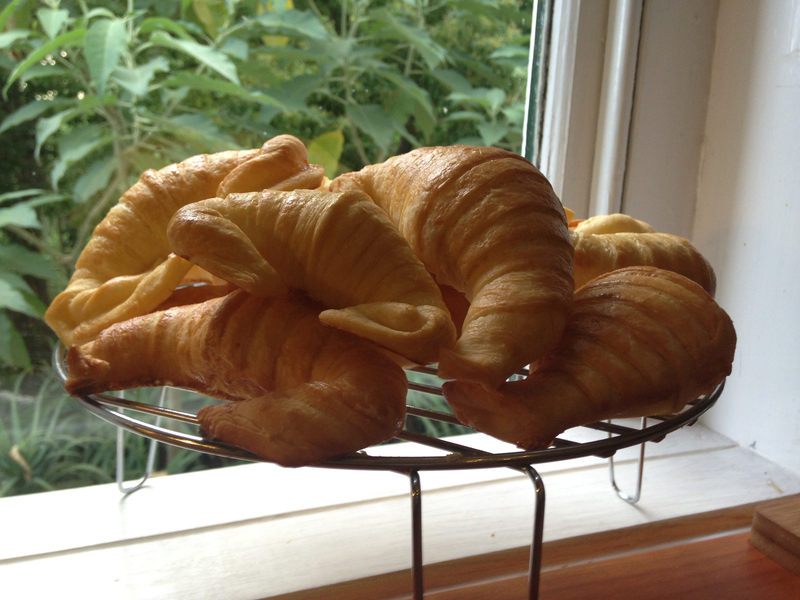 We honestly do not think many restaurants, let alone guesthouses make their own croissants. Here is a pic of some of this week’s batch. 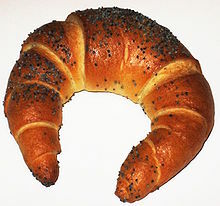 Crescent-shaped food breads have been made since the Middle Ages, and crescent-shaped cakes possibly since antiquity. Croissants have long been a staple of French bakeries and pâtisseries. In the late 1970s, the development of factory-made, frozen, pre-formed but unbaked dough made them into a fast food which can be freshly baked by unskilled labor. The croissanterie was explicitly a French response to American-style fast food, and today 30–40% of the croissants sold in French bakeries and patisseries are frozen. Today, the croissant remains popular in a continental breakfast. The kipferl, ancestor of the croissant, has been documented in Austria going back at least as far as the 13th century, in various shapes. The kipferl can be made plain or with nut or other fillings (some consider the rugelach a form of kipferl). The birth of the croissant itself – that is, its adaptation from the plainer form of kipferl, before the invention of viennoiserie – can be dated to at latest 1839 (some say 1838), when an Austrian artillery officer, August Zang, founded a Viennese bakery (“Boulangerie Viennoise”) at 92, rue de Richelieu in Paris. This bakery, which served Viennese specialities including the kipferl and the Vienna loaf, quickly became popular and inspired French imitators (and the concept, if not the term, of viennoiserie, a 20th-century term for supposedly Vienna-style pastries). The French version of the kipferl was named for its crescent (croissant) shape and has become an identifiable shape across the world. 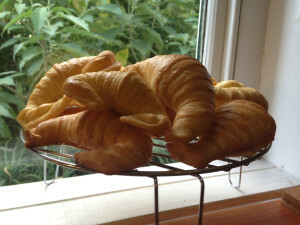 Alan Davidson, editor of the Oxford Companion to Food, found no printed recipe for the present-day croissant in any French recipe book before the early 20th century; the earliest French reference to a croissant he found was among the “fantasy or luxury breads” in Payen’s Des substances alimentaires, 1853. However, early recipes for non-laminated croissants can be found in the nineteenth century and at least one reference to croissants as an established French bread appeared as early as 1850. Zang himself returned to Austria in 1848 to become a press magnate, but the bakery remained popular for some time after, and was mentioned in several works of the time: “This same M. Zank…founded around 1830, in Paris, the famous Boulangerie viennoise”. Several sources praise this bakery’s products: “Paris is of exquisite delicacy; and, in particular, the succulent products of the Boulangerie Viennoise”; “which seemed to us as fine as if it came from the Viennese bakery on the rue de Richelieu”. The puff pastry technique which now characterizes the croissant was already mentioned in the late 17th century, when La Varenne’s Le Cuisinier françoisgave a recipe for it in the 1680 – and possibly earlier – editions. It was typically used, not on its own, but for shells holding other ingredients (as in a vol-au-vent). It does not appear to be mentioned in relation to the croissant until the twentieth century. Fanciful stories of how the kipferl — and so, ultimately, the croissant — was created are widespread and persistent culinary legends, going back to the 19th century. However, there are no contemporary sources for any of these stories, nor does an aristocratic writer, writing in 1799, mention the kipferl in a long and extensive list of breakfast foods. The legends include tales that it was invented in Europe to celebrate the defeat of the Umayyad forces at the Battle of Tours by the Franks in 732, with the shape representing the Islamic crescent; that it was invented in Buda; or, according to other sources in Vienna, in 1683 to celebrate the defeat of the Ottomans by Christian forces in the siege of the city, as a reference to the crescents on the Ottoman flags, when bakers staying up all night heard the tunneling operation and gave the alarm. This has led to croissants being banned by some Islamic fundamentalists.